We will make any product to your specification and to suit your needs. For further information email us. Below is part of our product range. All units are made of Black ABS Leather grain Plastic unless otherwise specified. All special orders require a 50% non refundable deposit. 4 Watt Economy Bank Teller Ultra-Violet Light. (EC4W) Height: 65mm, Width: 160mm and Depth: 120mm. 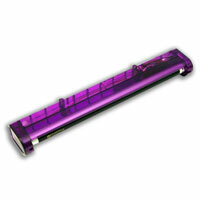 4 Watt Economy Bank Teller Diamond Ultra-Violet Light. (EC4WD) Fitted only with a Phillips Lamp for inspection of minerals. Height: 65mm, Width: 160mm and Depth: 120mm. 4 Watt Desktop Bank Teller UV Light. (DT4W) Similar to the Economy unit but higher. Height: 135mm, Width: 160mm and Depth: 140mm. 4 Watt Desktop Mobile Bank Teller Unit. 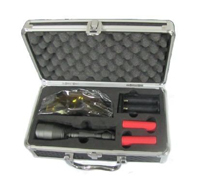 (DT4WM) This unit is fully portable and has got a built in battery for use anywhere anytime. The unit is supplied with a charger for the battery. The unit uses one 4 Watt Black Light Blue lamp. Height: 155mm, Width: 185mm and Depth: 155mm. 8 Watt Bank Teller UV Light. (BTC8W) This light has got one 4 Watt Black Light Blue for the inspection of Bank Notes as well as a 4 Watt Cool White Lamp to check Cheques and Passports. Height: 157mm, Width: 160mm and Depth: 135mm. 6 Watt Desktop Bank Teller UV Light. 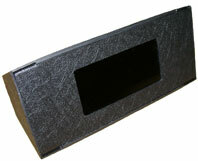 (BT6W) This Light is similar to the 4 Watt Desktop unit except that the unit is larger to accommodate the 6 Watt Globe. If you are interested in a 8 Watt version, this will have to be made up as it is a Non Stock Item. Height: 160mm, Width: 235mm and Depth: 160mm. 6 Watt Bank Teller Double UV Light. (BTD6W) The unit uses one 6 Watt Black Light Blue lamps. Bank Notes can be inserted from both sides of the unit. Height: 260mm, Width: 270mm and Depth: 120mm. 12 Watt Bank Teller UV Light. (BTC12W) The unit used 1 x 6 Watt Black Light Blue lamps and 1 x 6 Watt Cool White lamps. Height: 215mm, Width: 235mm and Depth: 155mm. 18 Watt Bank Teller UV Light. (BTC18W) The unit used 2 x 6 Watt Black Light Blue lamps and 1 x 6 Watt Cool White lamps. Height: 215mm, Width: 235mm and Depth: 155mm. 18 Watt Bank Teller UV Light. 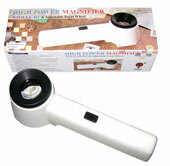 (BTC18W Magnifier) The unit used 2 x 6 Watt Black Light Blue lamps and 1 x 6 Watt Cool White lamps. The unit has got a built in 10x magnifier. Height: 215mm, Width: 235mm and Depth: 155mm. 18 Watt Bank Teller UV Light. (BTC18WM2) The unit used 2 x 6 Watt Black Light Blue lamps and 1 x 6 Watt Cool White lamps. Height: 135mm, Width: 235mm and Depth: 155mm. 24 Watt Bank Teller UV Light. (BT24W) The unit used 2 x 6 Watt Black Light Blue lamps and 2 x 6 Watt Cool White lamps. Height: 230mm, Width: 235mm and Depth: 155mm. 24 Watt Mobile Bank Teller UV Light. (BT24WM - Buddy) This unit is fully portable and has got a built in battery for use anywhere anytime. The unit is supplied with a charger for the battery. The unit used 2 x 6 Watt Black Light Blue lamps and 2 x 6 Watt Cool White lamps. 8 Watt Gooseneck Bank Teller UV Light. (GN8W) This unit has got a flexible gooseneck which can be bent so suit your needs. The units can be manufactured with a solid gooseneck. The units are available in 6 Watt and 16 Watt. Height: 300mm, Width: 120mm and Depth of foot 160mm. 4 Watt Gooseneck Bank Teller UV Light - Special. (GN4W Special) This unit has got a flexible or fixed gooseneck for a table mount application. The units are also available in 8 Watt. 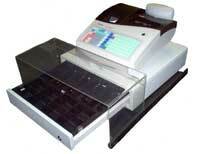 6 Watt Cash Register Bank Teller UV Light. 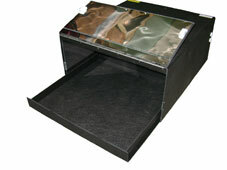 (CR6W) This unit is ideal to mount under the counter above a Till Drawer. 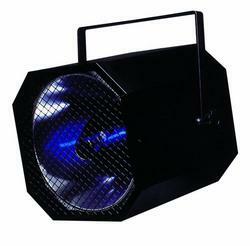 The unit is also available in 4 and 8 Watt versions on request. Height: 40mm, Width: 290mm and Depth: 35mm. 8 Watt Hand Scanner UV Light. 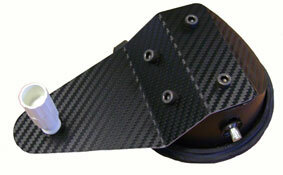 (HS8W) This unit is supplied with a battery pack that clips on to your belt. The scanner can then be held in your hand for inspection purposes. The unit is supplied with a charger. 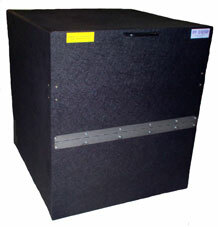 The unit is also available in 16 Watts. 12 Watt Hand Scanner UV Light with UV Filter. (HS12W) This unit is supplied with a battery pack that clips on to your belt. The scanner can then be held in your hand for inspection purposes. The unit is supplied with a charger. The unit has got a 365nm (UV-A) and a 254nm (UV-C) lamp and is fitted with a UV Filter. This is essential for the inspection and detection of minerals and diamonds. 16 Watt Hand Scanner UV Light (Short Wave and Long Wave) (HS16W) This unit is supplied with a battery pack with a shoulder strap. The unit containing the lamps is hand held. The unit contains a Short wave and a long wave lamp for inspection of minerals. 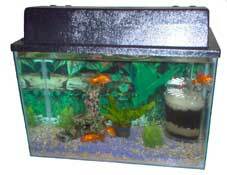 Fish Tank / Aquarium Light (Tank and lid excluded) The unit can be made up to size depending on the size of the tank. 18 Watt Hand Scanner (HS18W) This unit is mains operated and comes with a 4 meter cord. The unit has got one 18 Watt Bi polar globe. 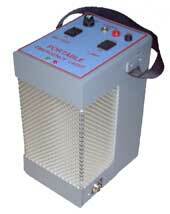 Mattress Sterilization UV Light (MS25W) This is a hand held 25 Watt Sterilization unit used to clean a mattress. The light will get rid of all sorts of bacteria on the mattress as well as kill the bed mites. Height: 75mm, Width: 460mm and Depth: 105mm. Pet Urine Detection Light (PU12W) This is a 12 Watt Hand Held unit which is light to carry around and simple to use. For best results use the light in total darkness. Height: 65mm, Width: 235mm and Depth: 100mm. Spot Spotter Urine Detector This is a 8 Watt Hand Held unit which is light to carry around and simple to use. ( 8 x AA batteries - NOT included.) For best results use the light in total darkness. Height: 35mm, Width: 320mm and Depth: 55mm. 160 Watt Hand Scanner (HS160W) This unit is mains operated and comes with a 6 meter cord. The unit has got one 160 Watt HMV BLB globe. The unit is NOT manufactured from ABS plastic but a powder coated metal. Tin Side Detector (HSTIN) This is a hand held 4 Watt 254nm unit used to check for the tin side of float glass. Height: 65mm, Width: 160mm and Depth: 70mm. These are great and fun for Halloween, Events, parties, Clubs, 4th of July, Camp Grounds, Party Favors, Fundraisers , Weddings, Making Money, Mardi Gras , Camping, Bars and for all Recreational purposes. Play with it. There's an endless list of things you can do with it. Twirl it really fast to create a blur. Throw it up in the air and catch it. 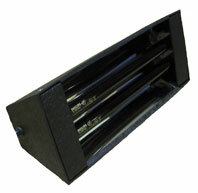 12 Watt Hand Scanner (HS12W) This unit is mains operated and comes with an optional stand. The unit has got two 6 Watt Lamps, one SW and the other LW. 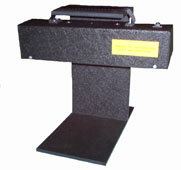 Hand Scanner: Height: 60mm, Width: 260mm and Depth: 60mm. 8 Watt Hand Wash and A4 Inspection Lamp (HW8W) This unit is ideal to check A4 documents. The unit operates with a 8 Watt BLB lamp. Height: 220mm, Width: 350mm and Depth of 250mm. 20 Watt Hand Scanner Glass Bonding and Repair Curing Unit (HS20W) This unit is mains operated and comes with a 4 meter cord. 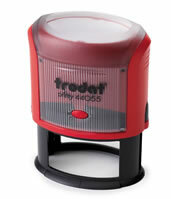 The unit is fitted with a 20 Watt Curing Globe. The unit is also available in a 40 Watt version. (Both units are 610mm long) Height: 85mm, Width: 610mm and Depth: 130mm. 9 Watt Windscreen Curing/Repair Unit. (WS9W) The unit is used to cure the gel used to repair cracks and chips in windscreens. 12 Volt. Height: 55mm, Width: 200mm and Depth: 60mm. 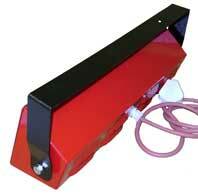 4 Watt Windscreen Wand Curing/Repair Unit. 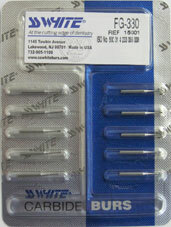 (WS4WW) The unit is used to cure the gel used to repair cracks and chips in windscreens. 12 Volt. Height: 35mm, Width: 255mm and Depth: 50mm. 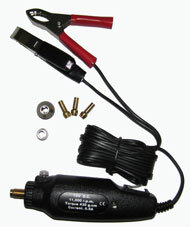 4 Watt UV Torch. Ultra-Violet florescent Light to expose the UV reflecting markings in Bank notes. Also usable to expose ultra violet reflecting markings on paper, stamps etc. Flashlight integrated. 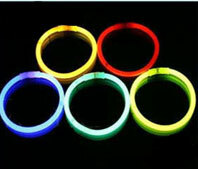 Height: 20mm, Width: 60mm and Length: 161mm. 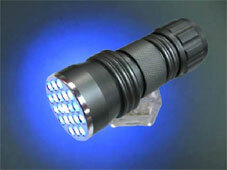 Mini 9 LED UV Torch. Ultra-Violet florescent Light to expose the UV reflecting markings in Bank notes. Available in black only. Length: 97mm and Average Diameter 30mm. 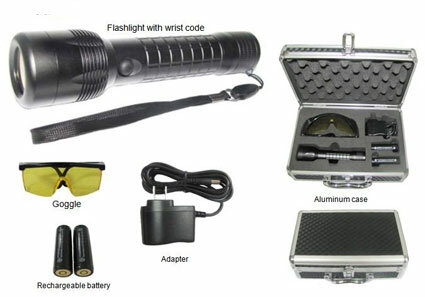 Mini 21 LED UV Torch. Ultra-Violet florescent Light to expose UV reflecting markings. Length: 95mm and Average Diameter 32mm. Lamps (Globes) Please call us with your requirement, so that we can quote you on the correct replacement lamp. UV Powder. An invisible UV powder, supplied in a 50g container, which is ideal to connect a suspected thief to a crime. Once applied, the invisible powder will be transferred to the skin when contact with the item is made. The powder will then show up under a UV lamp. 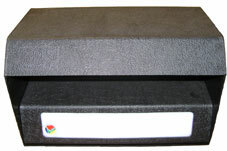 Ideal for use on documents, bank notes etc. The powder is available in blue and red. These colours are visible under UV light only, as the powder is almost white to the eye. The powder is also available in red which lights up luminous red under UV light. 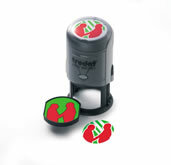 Rubber Stamps. 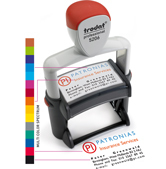 We will have any stamp made up for you, to either use with our UV Ink or to use with standard colour ink. We also supply stamp pads, which are un-inked. 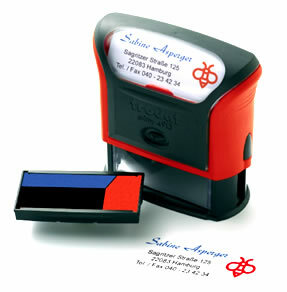 It takes approximately 24 hours to have your stamp made up. UV Pens A UV marker pen for quick, easy marking of almost any item. The mark will last for months under normal conditions, but can be removed with solvent. Counterfeit Money Detector Pen This pen, with a single stroke, reveals whether a banknote is counterfeit or genuine. The pen will provide up to 4000 strokes. A dark brown line indicates a fake note and an almost invisible yellow line shows the note to be genuine. The pen works on over 140 currencies. 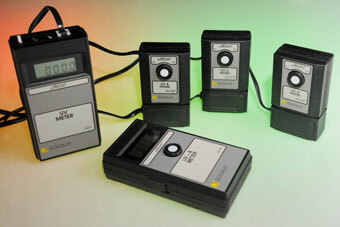 Light Meters We supply UV Light Meters for the UV-A, UV-B and UV-C range. 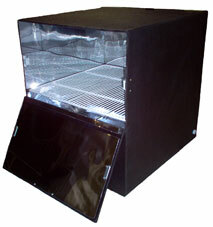 The unit is available as a display unit with plug in probes or for the UV-A as a stand alone complete unit. 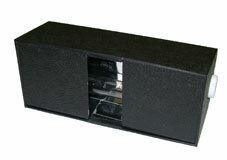 Cash Register Protector (Cash Register NOT included) This is a clear cover for your Cash Register (Till) drawer and will prevent the unwanted hand in your drawer, removing your cash. 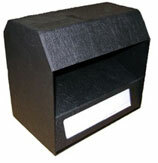 Brochure Stands (BSA4 & BSA5) Useful for the display of your brochures, to prevent untidy papers. Available in Free Standing or Wall Mount Options. EPROM Eraser 4 Watt. (EE) The unit has a small drawer that can accommodate up to 16 EPROM's depending on the size of the chip. Bacterial Inspection Unit 8 Watt. 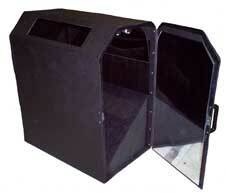 (I8WS) This is a unit with a front door so that the specimen can be put into the cabinet. The specimen is than viewed through the top viewing slot. Height: 130mm, Width: 310mm and Depth of 205mm. 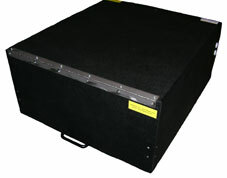 Inside Packing Space: Height: 110mm, Width: 305mm and Depth of 150mm. Bottle Cap Sterilization Unit. This unit is used to sterilize bottle tops before they are put on to the bottle in the bottling process. This eliminates foreign bodies and bacteria being put into the liquid or powder in the bottles. 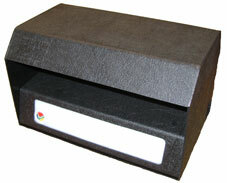 The unit is supplied with 2 drawers and it is fitted with a timer. Security Paper Inspection Unit. The unit has got a 55W Germicidal Lamp and a 40 Watt BLB and is supported by a swing arm with a G-Clamp. The unit is approximately 1.5m wide. 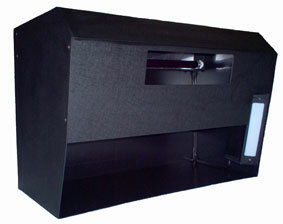 Bacterial Inspection Unit (I2x4WS) This is a unit with a front door so that the specimen can be put into the cabinet. The unit has got two 4 Watt globes, one at the top and the other at the bottom. Height: 550mm, Width: 500mm and Depth: 500mm. 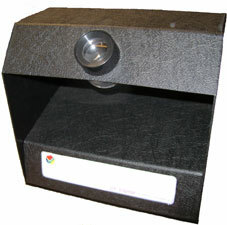 Bank Teller Cheque Inspection Unit (CI) This is a 18 Watt BLB unit and is used for the inspection of bulk cheques. The unit has also got a 6 Watt Cool White light for verification of watermarks. Height: Approximately 450mm, Depth: 400mm and Width: 700mm. Nappy Curing UV Box (NABO) This is a 30 Watt unit and is used in the assembly process of Disposable Nappies. Height: Approximately 600mm, Depth: 400mm and Width: 500mm. 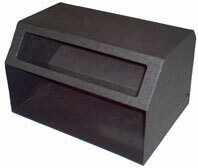 Curing Box 27 Watt with Drawer for the Manufacture of Jewellery. (Similar to picture) This is a 27 Watt unit and is fitted with a preset timer and is used to cure moulds for rings, bangles etc. Gel Nail Curing Lamps 9 Watt. (GL9W) The product is available in blue or black. The standard unit does not have a timer, but one can be fitted for a preset time. Gel Nail Curing Lamps 18 Watt. (GL18W) The product is available in blue or black. The standard unit does not have a timer, but one can be fitted for a preset time. Height: 120mm, Width: 200mm and Depth: 150mm. Gel Nail Curing Lamps 36 Watt. 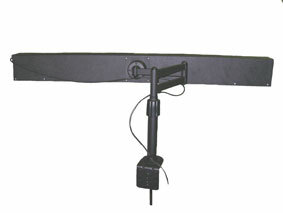 (GL36W) (4 Lamps) The product is available in blue or black. This unit comfortably allows two hands to be placed in the unit, at the same time, for Gel Nail curing. The standard units do not have a timer, but one can be fitted for a preset time. Portable Emergency Light Ever sat without electricity? Here is the answer, a Portable Emergency Light. 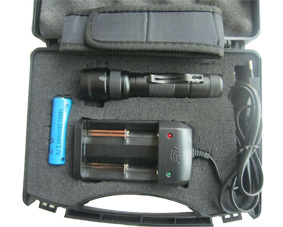 The light is supplied with a charger and can work with Mains, 12V or its own battery. IR (Infra Red) Zone Heater 1.5kW. Infrared Zone Heaters are 90% more economical than gas. 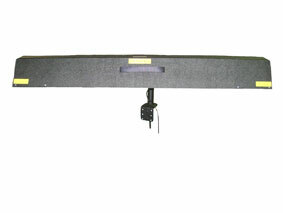 The infrared zone heaters have a wide range of applications in the work place. Each heater is fitted with the Philips Helen lamp. Specialized Units. We will manufacture any unit of any size and shape to suit your needs. Suitcases. We can make any suitcase to suit your needs. We however do not supply the foam inserts. Some models have got a two to three week delivery period from date of order. All products have got a 1 (one) year manufacturers carry-in warranty, but the warranty excludes the starters and globes. All products work on 220/230 Volts, unless otherwise specified. The most popular configuration of UV lights is the Combination Short Wave/Long Wave units. 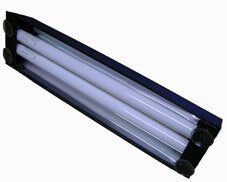 When deciding on which UV lamp to purchase, keep in mind that generally, the higher the wattage, the brighter the lamp. It also follows that the brighter the lamp, the less need there is to use it in the dark in order to see the fluorescent effect.